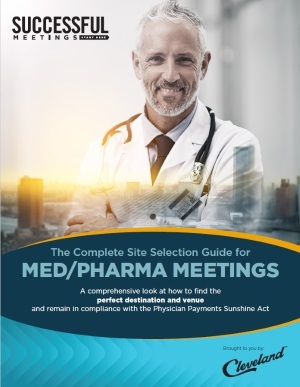 Successful Meetings presents a comprehensive look at how to find the perfect destination and venue for successful med/pharma meetings, while remaining in compliance with the Physician Payments Sunshine Act. The Complete Site Selection Guide for Med/Pharma Meetings is brought to you by Cleveland. Successful Meetings presents a comprehensive look at how to find the perfect destinations and venues for successful med/pharma meetings, while remaining in compliance with the Physician Payments Sunshine Act. In the highly specialized world of med/pharma meetings, September 30, 2014 was a landmark date. That was when the U.S. government published the first set of data reported by pharmaceutical companies and medical device manufacturers under the Physician Payments Sunshine Act, also known as Open Payments. Meeting planners have a lot of responsibility when it comes to complying with these guidelines so it’s a relief when they find destinations, hotels, and venues that understand their unique needs, and go above and beyond in helping to execute meetings that are fully comply with the regulations. Successful Meetings' "The Complete Site Selection Guide for Med/Pharma Meetings" will help you find the right partners.